A moviegoer caught secretly recording the sci-fi blockbuster "Transformers" has been charged with unauthorized use of a video camera in a theater in the first arrest under a new New York City law that stiffened penalties for pirating films. A criminal complaint accuses Kalidou Diallo of slipping a video recorder, video player and remote control into a sneak preview of the film at a Bronx theater on Monday night. "This is the first time someone has been arrested and charged with the new illegal camcording law," City Hall spokesman Jason Post said Thursday. In May, Mayor Michael Bloomberg signed legislation that upgraded film piracy from a violation with a $250 fine to a misdemeanor that carries up to six months in jail and penalties of up to $5,000. The Motion Picture Association of America says more than 40 percent of bootlegged films are secretly videotaped in New York City theaters. The copies typically are sold for mass reproduction or posted on the Internet, sometimes just hours after the movie has opened. 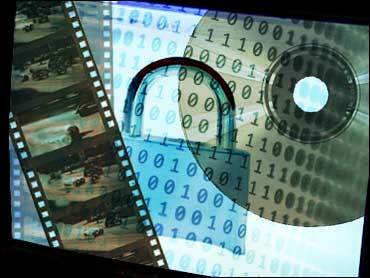 Pirated movies cost major U.S. film studios more than $6 billion in 2005, according to the trade association. A study by the group showed that the New York movie industry loses an estimated $1.5 billion a year because of piracy, and the local economy suffers further with lost earnings, tax revenue and jobs. Police arrested Diallo, 48, after a plainclothes officer seated behind him while staking out the theater saw him raise his right arm after the film began, court papers said. During a search shortly after the movie ended, police found a video recorder "strapped underneath his right arm via a body harness" and a video player and remote control in his jacket pockets, the papers added. Diallo was released on Tuesday without bail and ordered to return to court on Sept. 20. No telephone number was listed for his Bronx address, and the name of his lawyer was not immediately available. "Transformers" broke box-office records on its official opening day Tuesday, taking in $27.4 million to set a new high for Tuesday openings. The movie — based on the Hasbro toys that debuted in the 1980s — chronicles a war between two factions of giant shape-shifting robots that bring their battle to Earth. The cast includes Shia LaBeouf, Tyrese Gibson, Jon Voight, Josh Duhamel and John Turturro.